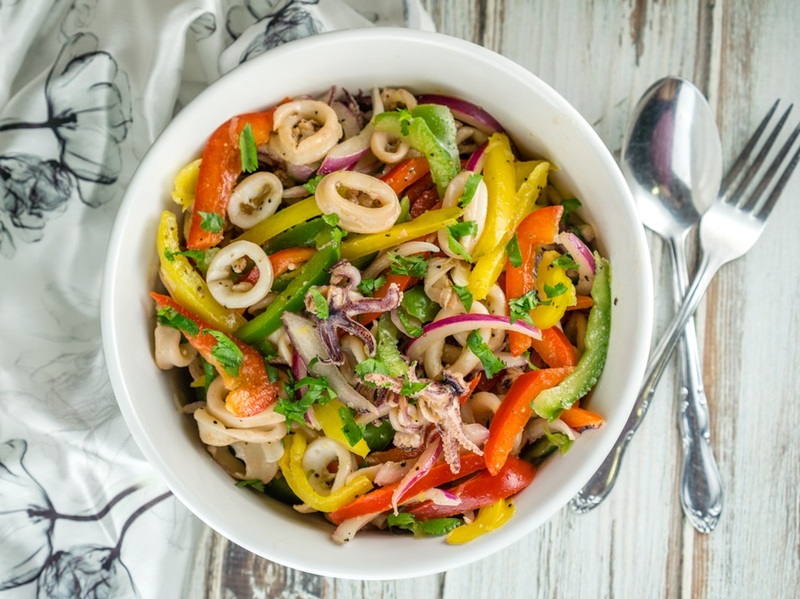 This Calamari Salad features tender calamari, crisp bell peppers, and a zesty lemony dressing. It is light, fresh, healthy, and delicious. Combine the chopped calamari with the lemon pepper seasoning and mix well. Heat the olive oil in a large skillet and cook the calamari for about 5 minutes or until fully cooked, stirring frequently. In a large bowl, toss together the sliced red onion, rice vinegar, lemon zest, and lemon juice. Allow the marinate while you prepare the rest of the ingredients. Add the cooked calamari and the rest of the ingredients (sliced bell peppers, olive oil, minced garlic, salt, pepper, and chopped parsley) to the large bowl with the marinated onions. Stir well and allow to chill in the fridge for at least 30 minutes before serving, stirring every 10 minutes to distribute the zesty lemon dressing.